The Petite Tot Division is designed for your youngest dancers and is a caregiver and me class where an enchanting bond is inevitable. Children as early as 24 months can benefit from a very early introduction to ballet all the while exploring their creative potential of both body and mind. 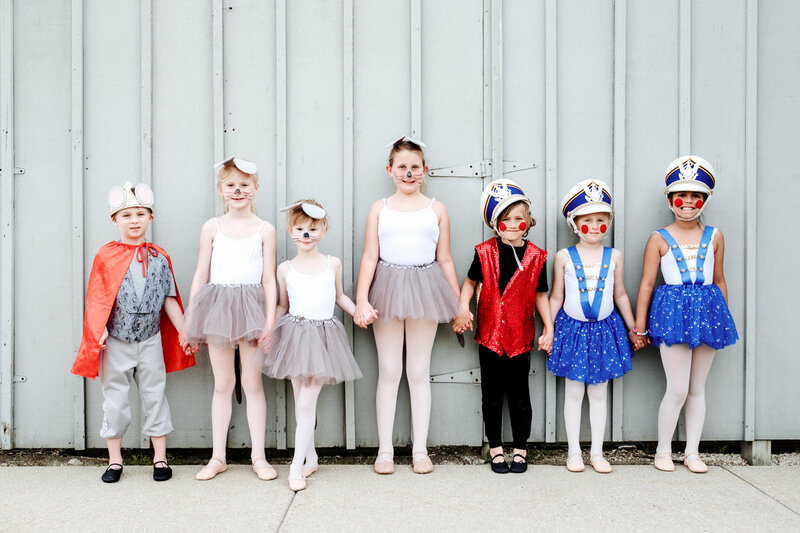 This class treats our youngest dancers to movement, creativity and exploration of the mind/body connection in the most whimsical way possible. The Children's Division is designed to embrace a more independent child while teaching them the fundamentals of classical ballet. Still maintaining the magic and whimsy of our storybook approach, this division introduces more structure while embracing and protecting their beautiful imaginations. The Pre-Ballet Division is designed for our dancers who are booming with confidence and have a pretty solid sense of self. We continue to build on the foundation of their early introduction to ballet with more structure and more skill as they "grow up" in our program. Although there is more focus, the magic and whimsy is never compromised as we never grow too old to twirl to our heart's content on our tippie toes. The Ballet Division is designed for our more advanced dancers who have successfully mastered the Pre-Ballet Division. Our dancers are ready for a more disciplined study of classical ballet. In this division our students receive a more comprehensive study of ballet with emphasis on terminology and proper body alignment. This division includes warm-up at the barre, center floor work and classical ballet combinations. We still incorporate the storybook approach with our more advanced divisions because learning about the history of these ballet stories only compliments their growth as dancers and lovers of this beautiful art form. * Please note your child must be 3, 4 or 5 by September 1st to enroll in their respective Children's Division. The Ballet 1 Division is designed for our more advanced dancers who have successfully mastered the Pre-Ballet Division. Our dancers are ready for a more disciplined study of classical ballet. In this division our students receive a more comprehensive study of ballet with emphasis on terminology and proper body alignment. This division includes warm-up at the barre, center floor work and classical ballet combinations. We still incorporate the storybook approach with our more advanced divisions because learning about the history of these ballet stories only compliments their growth as dancers and lovers of this beautiful art form. The 2018|19 Academic Year is now closed for registration. Please check back on 5/1/2019 for our 2019|20 schedule! Our 6-Week Summer Ballet Education Program is designed much like our regular Academic Year with weekly classes offered 1x a week for 6 weeks for $135. We offer this 6-week dance program in the summer to keep dancers moving and to maintain all they learned through the year fresh in their minds! And (of course) we always feature a magical theme inspired by some of the world’s most beautiful ballets stories. The program runs between 7/8 - 8/17/2019. Our Summer Camps are our most popular summer program! We offer 4 different week-long camps (Monday – Friday from 9 – 11:30am). Each camp week has a different theme and their day is filled with ballet classes, crafting and more! Our camps are designed for children ages 3 (must be pottery trained) to 10! But, our camps are pretty popular and we have several kids older than 6 who come back every year (and often multiple camps weeks) because it is that fun. Our Summer Intensive is designed for our older ballet dancers (currently enrolled in Ballet 1 or moving into the Ballet I Division in the upcoming year). This program is also for students who practice at other studio’s but are looking for a summer intensive. Placement will be required for those students we have not worked with in our program. The Summer Intensive is designed to give our more advanced dancers a concentrated study of technique and terminology! This will be accomplished through barre work, center work as well as intense stretching to build flexibility and core strength. However, we won't leave out the magic and whimsy we are known for and so will incorporate it into our intensive study of ballet through crafts, stories and learning more about the history of ballet. We do this to continue to create a foundation of love for the art-form - which only enhances their practice. 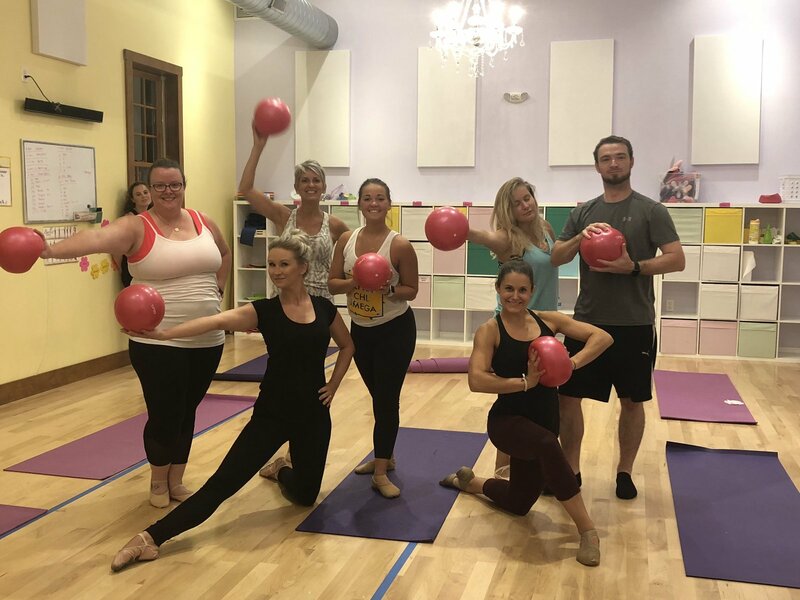 Adult Ballet is for those who have always wanted to try Ballet and for those who are looking to use dance-based fitness as a way to achieve a healthy lifestyle. 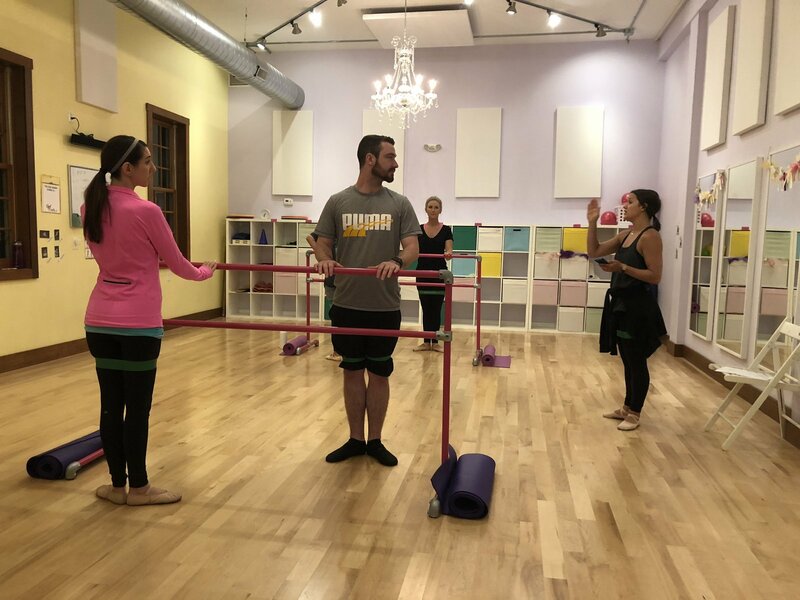 Our students will do a traditional barre warm-up, movement in the center, and some faster paced movement across the floor. No matter your style or level, advanced or beginner, our Adult Ballet classes are perfect for every kind of dancer. Our sessions are 8-week sessions with weekly classes. We do require a minimum of four (4) Adult Ballet students to register in order to hold the class. Should we not meet our minimum, your tuition will be refunded or credited toward another program. For more information, please contact us at info@petitepasballet.com to determine if our Adult Ballet program is the right fit for you. The Essentrics Program® is designed with seniors in mind! Rebalance your body, unlock tight joints, improve your posture, change the shape of your body and increase your flexibility and overall strength. This low-impact, equipment-free class is perfect for men and women and will leave you feeling energized, youthful and healthy. Essentrics® is a dynamic, full-body workout that simultaneously combines stretching and strengthening, while engaging all 650 muscles.